SAN FRANCISCO — The unmanned rover that NASA plans to launch toward Mars in 2020 should gather up Red Planet rocks and dirt for delivery to Earth someday, some experts say. NASA science chief John Grunsfeld announced the new rover here Tuesday (Dec. 4) at the annual fall meeting of the American Geophysical Union. Details of the roughly $1.5 billion mission have yet to be worked out, but some big names in the Mars community are already pushing hard for a sample caching system. "I hope and expect that its main mission will be to collect and cache a well-chosen set of samples for eventual return to Earth," Steve Squyres of Cornell University, principal investigator for NASA's Opportunity Mars rover, told SPACE.com via email. Former "Mars czar" Scott Hubbard, who restructured NASA's Red Planet program after it suffered several high-profile failures in the late 1990s, echoed Squyres' sentiments. "I’m delighted to see the Obama Administration lay out a plan to return a NASA rover to the surface of Mars in 2020," Hubbard, who's currently at Stanford University, said in a statement. “If a caching system is included, we can begin moving toward a sample-return campaign, as recommended" by the NRC. Bringing pieces of the Red Planet back to Earth would allow researchers to examine them in fully equipped laboratories, which many scientists regard as the best way to search for signs of Martian life. Grunsfeld said NASA wants the 2020 rover — whose chassis and landing system will be based heavily off the agency's Curiosity rover, which landed on Mars Aug. 5 — to help pave the way for sample-return. But he doesn't know if it will feature a caching system. That determination is up to the "science definition team," which will be meeting over the next few months to map out the new rover's mission. "The question of caching is going to be a trade-off case," Grunsfeld said. "The science definition team is going to have to weigh, what science do we want to get done? How much mass and power do we have available? What can we get to the surface, and where do we want to go?" Ray Arvidson, deputy principal investigator for the Opportunity rover and a participating scientist on Curiosity's mission, also hopes the new rover has a caching capability. But he says the 2020 mission will likely be a step toward sample-return no matter what its goals turn out to be. "Anything we do on the surface, in my view, gets toward sample-return, particularly if we can tweak the payload — and it can be the engineering elements — that rehearse some of the things we want to do for sample-return," Arvidson, who's based at Washington University in St. Louis, told SPACE.com. "That includes what measurements to make to select the right samples, and anything that we can do in terms of acquisition, handling and packaging," Arvidson added. "Do that, and we're moving toward sample-return." 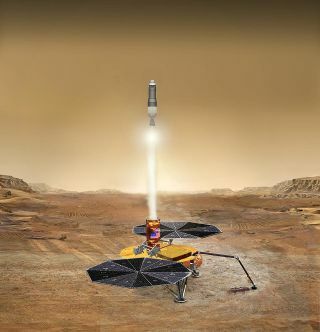 Arvidson also stressed how exciting it is to have another rover mission launching toward the Red Planet in 2020, given the funding situation of NASA's Mars program. The program suffered deep cuts in the White House's proposed 2013 budget, forcing the agency to downscale and rethink its Red Planet plans. "This is good news, really good news," Arvidson said.